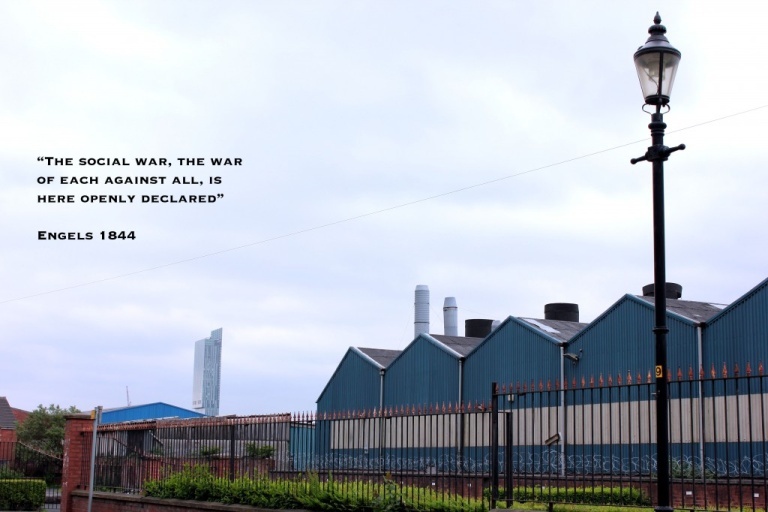 This project is inspired by Engels’ book written in 1844, The Condition of the Working Class in England. How much has really changed since then? The power relations in our society remain essentially the same. As a result working class people rarely get to tell their own stories. Their stories are told for them by people who have no experience of being working class. The consequences of this, politically, socially and culturally, are far reaching and devastating. Over the course of two months we worked with artistic director Jimmy Fairhurst and a group of volunteers from Salford and Manchester. Drawing on their own experiences of working class life and directed by Jimmy, they created an extraordinarily powerful theatrical performance that was in turn, moving, funny, defiant and angry and showed that the condition of the working class remains marked by the same kinds of hardships, struggles and inequalities as in Engels’ time. The people who came together to do this show turned from a group of strangers, many of who had never acted before, into The Ragged Collective, in little more than two months. The whole process, from first rehearsal to the first night performance has been captured on film by Inside Film. The resulting documentary (now in post-production) The Condition of the Working Class, links the struggle to get the performance on stage to the broader struggles of the working class today. Visit the documentary website conditionoftheworkingclass.info for more information and view the trailer on-line by clicking on this link.